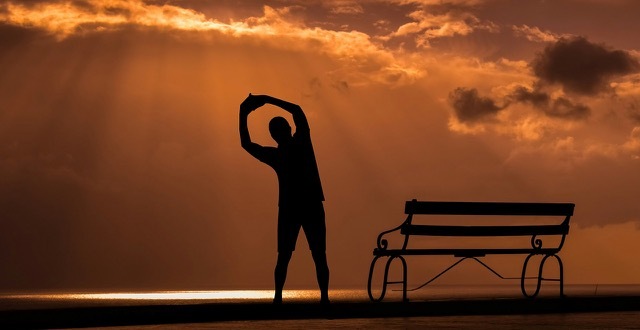 Like muscle and aerobic exercise, stretching should be a part of your fitness regime. Many people don’t consider stretching as part of their fitness regime but should. Daily stretching is essential to maintain mobility and independence. You will get the best results from stretching when muscles are warm such as after a workout or training session. Stretching helps the muscles stay flexible, strong, and healthy. We need that flexibility to maintain a range of motion in our joints and range of motion is KING as we age! Without that flexibility, our muscles shorten and become tight. Then, when you call on the muscles for activity, they are weak and unable to extend all the way. That puts you at risk for joint pain, strains, and muscle damage. Today’s information-driven world requires many to sit at a desk for most of their workday. Desk workers will experience tightened hamstrings in the back of the thigh. Tighter, shortened psoas muscles is also a common problem with desk workers. Tight hamstrings prohibit extending the leg or straightening the knee completely. This, in turn, will inhibit activities as simple as walking. Stretching tight muscles during strenuous exercise makes them vulnerable to damage. Injured muscles might not be strong enough to support joints, and this can result in a secondary injury or chain injuries to joints. Stretching keeps muscles long, lean and flexible; physical exertion will not over-stress the muscle. You should make an effort to stretch at least three to four times per week. Stretching is not a one and done undertaking. There is no magic set of stretching movements that will give you greater flexibility. Mobility techniques are used as well. You’ll need to make stretching a habit. You must remain committed to the process for the long-haul. Your muscles did not become tight overnight. it’s going to take more than a few sessions to return them to their flexible state. It will take weeks, possibly months, to return your muscles to a flexible state. Once you achieve flexibility you will need to stay committed to maintaining it. Indy Core Fitness can assess your muscle strength and tailor a plan to fit your needs. If you have a chronic illness you will need to consult your doctor before starting.